Last month for my blog here at hitting the hot spot I revealed some secrets about the Were Chronicles world. I really enjoyed the emails that I received from that post. This month I ran a contest where readers and fans could submit questions they wanted answered during this blog post. I was very pleased by the response! I took the most popular questions and ran with it. I also want to take a moment to Thank everyone who submitted questions and answered the contest. The contest winner Ashley C. will receive a $25.00 gift card from Amazon for participating. The Were Chronicles were my first step into the world of writing series books. In all honesty I could never have imagined it would be so well received. And each and every one of you is to Thank. Without the readers, editors, cover artists, and publisher I would never be primed to release three more Were Chronicles books this year. So a big hug and a kiss go out to you! Q1. How many Were Chronicles books will there be? A1. I hate starting with a question that I can’t answer completely but this was the number one question I received. For my answer all I can say is that there will be more books. As many books as we need to see the Packs through going public and finding their mates. Three more books will be released in 2013 for certain. The next three books after that have been outlined. Q2. Will we see any of the old Alphas’s and Mates appear in future books? A2. Absolutely! They wouldn’t be the Were Chronicles if we didn’t get to go back and see our favorites. As a matter of fact in the next three installations you see older characters pop up for offer help as the new Packs deal with coming out to the world. Q3. Will there be other types of shifters stories in the future? A3. Yes, there will be other shifters in the Were Chronicles. They must work together to overcome the challenges of going public. *NOTE* There are exciting things coming through the Were Chronicles. Felines, Bird, Bear, and other shifters. There will be more on these other shifters very soon. I promise. Q4. Will there be other shifters who cannot shift? A4. Yes, in book eight you will learn a little more about what Gage and Marisa have been working on while they have been quiet. Gage has several scenes in book 8. Q5. Will a shifter ever mate with a human? A5. Yes! I know you have been waiting for it. In book eight the main female character is human. Q6. Will the Were Chronicles move to other countries? A6. I’m not sure. I would love to see more about the Packs all over the world. I have been some research and I think it is possible but right now that is up in the air. These were all great questions and again Thank you everyone for getting involved in my blog project. The Were Chronicles have been the subject for the last several months due to the fact that so much is going on with them. We will have three more ebooks releases with the first one being released for Pre-Order next month!!! Here is more on Were Chronicles Book Seven Pack Daughter. I hope you enjoyed the peek into what is and will be going on. 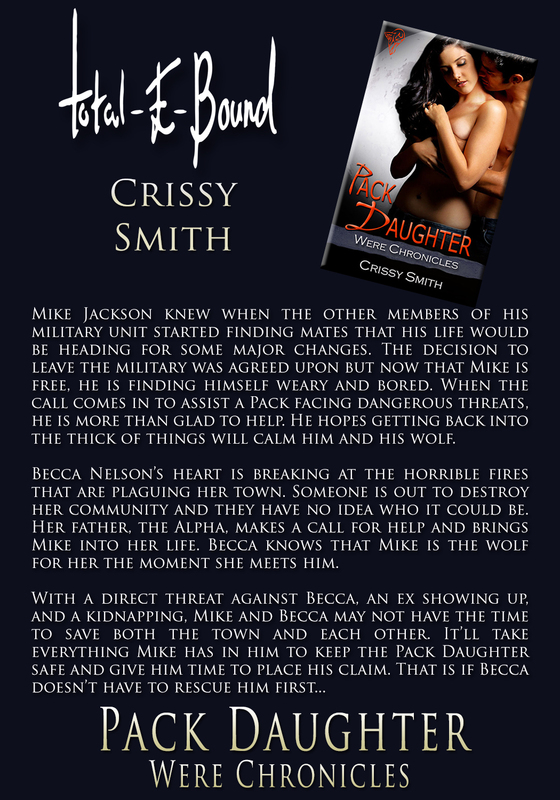 Don't forget to check with Total-E-Bound is August for your Pre-order and VIP release of Pack Daughter!! !